Degates’ purpose is to aid reverse engineering of digital electronics in integrated circuits (ICs). Degate helps you to explore images from ICs. 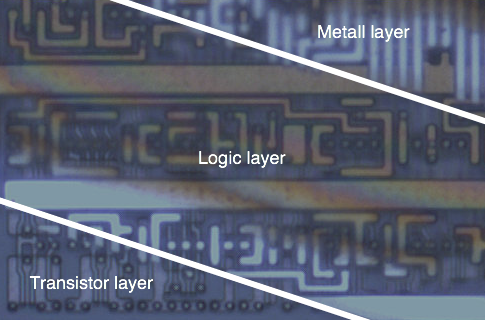 It matches logic gates on the imagery given by graphical templates and it assists you in tracing circuit paths. Degate is not a completely automatic analyzing tool. Degate helps you with some automation in your manual reverse engineering process. Degate is developed under OS X and Ubuntu. The GUI is based on gtkmm. So degate should run on any unixoid platform, where gtkmm was ported to. Degate is a spare time project. It is still under development. Some project steps are already implemented other steps are not. Please have a look at the status page to see, what is implemented until now. Degate is open source. It is released under the GNU General Public Licence Version 3.